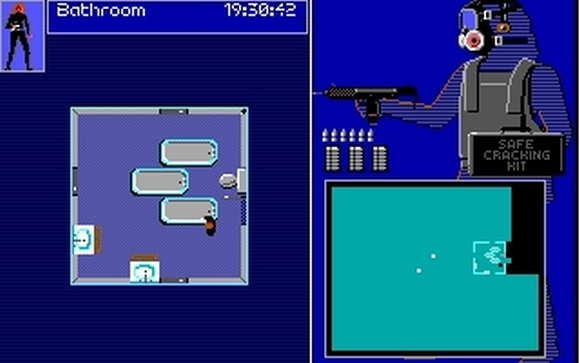 This is only partially a reflection of the era Covert Action was released into; the game’s 256-colour graphics are vomit-inducingly ugly and 1990 apparently predates computer mice or something so you have to use the keyboard, but these are the least of the game’s worries.1 The problem is that whereas something like Pirates took care to come up with interesting minigames first and then based the game around them, Covert Action’s minigames are almost an afterthought. They play like filler content that pads out the main gameplay (so I suppose in some ways Covert Action is simply ahead of its time) except because Covert Action is all minigames nearly the entire thing turns out as filler content. The only remotely interesting one is the bug-planting minigame, where you have to redirect… electricity? I think it’s electricity. Anyway, you have to redirect electricity to the target nodes while avoiding activating the alarm nodes by swapping out circuit board components, and it’s not half-bad as a minute-long puzzler. The rest are just awful; codebreaking is asininely simple, tailing is unremittingly tedious, and while infiltrating hideouts can be entertaining, it’s the same sort of entertaining as Sumotori Dreams. Which begs the question: if the game isn’t very good, then why am I bothering to talk about it? 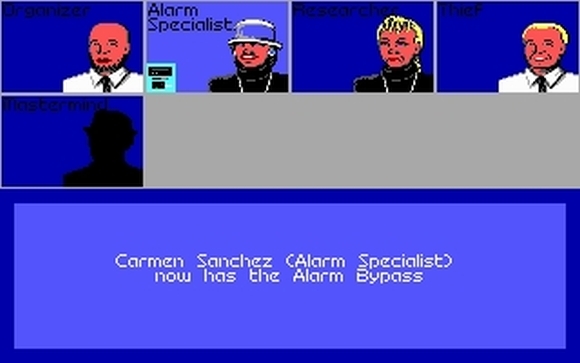 The thing is that while Covert Action’s minigames are a stale and tedious bunch, the overplot that ties them all together is actually a really interesting attempt at representing a spy agency’s investigation of a terrorist organisation. When you start a case the game generates a group of conspirators and a plot they’re trying to carry out, tosses you a few clues to get you started in your investigation, and then leaves you to get on with it. You can follow up the leads you’ve been given in any order and in any way that you want, but everything you do in the game takes a certain amount of time during which the conspirators will be trying to move their plot forward. Spend too much time running down a blind alley and you’ll miss opportunities; key conspirators will go into hiding once their role in the plot is finished and you won’t be able to arrest them, and if you’re a truly world-class ditherer they’ll actually accomplish whatever it is they set out to do like bombing the embassy or assassinating the president or whatever. This is the key element that keeps me slogging through all those terrible minigames – just knowing there is a plot running entirely autonomously in the background that needs to be foiled is a remarkably compelling story hook. The best thing about it is that aside from the starting clues – and a few teletyped bulletins if you’re playing on the lower difficulty settings – the only information you have about what the terrorists are doing is the information you uncover yourself during the course of your investigation. You can get this information through a number of channels; planting bugs will give you fragments for each target node you manage to successfully connect to, while tailing a suspect can lead you to the lair of another conspirator. Every piece of info you discover is another piece of the jigsaw that will eventually allow you to crack the plot wide open. Crucially, though, each method of investigation has an associated risk of discovery attached to it. For example, busting into a terrorist safehouse in person and photographing all their secret files is an excellent way to get information, but it carries a very high chance of being spotted by a patrolling guard. Being discovered tips the terrorists off that you’re on to them, and while they won’t stop their plot it’ll both make non-essential plot members more likely to go into hiding and beef up the security during subsequent infiltration attempts, making your job much harder. It can be worth the risk. Each plot has an associated mastermind figure, who doesn’t get involved directly and is very difficult to identify. Apprehending the footsoldiers and mules in the conspiracy is relatively easy, usually requiring only one or two bits of incriminating information. Just figuring out who the mastermind is, on the other hand, requires you to stuff your dossier full of as much evidence as possible without the terrorists finding out that law enforcement is after them. Of course while you’re gathering this evidence the terrorists are moving forward with their plans, and so if you want to bag the mastermind it turns into a race against time to get their name before they advance their plot to completion. This is made doubly tricky by the fact that once a plot can no longer be completed (due to you arresting a key conspirator or seizing essential equipment) every member of the conspiracy that is still at large will go into hiding; you may have stopped the plot, but you didn’t get the plotters, and this is reflected in the score you’re awarded after wrapping things up. 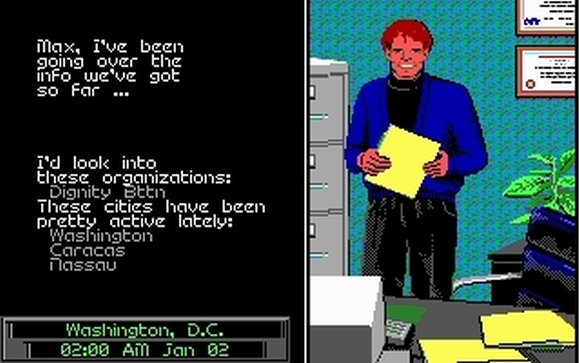 Before it does this, though, Covert Action will deploy its masterstroke of game design. All the time you’ve been playing the game you’ve been trying to tease apart the various threads of the plot based on nothing more than the information you uncover yourself. You know it’s going on in the background but all you have to work on are the barest glimpses of the full picture, and you’re constantly fighting against this fog of uncertainty as to whether e.g. flying to Caracas to visit the safehouse there will be a worthwhile lead or a complete waste of your time. Not being sure about what is going on or what to do next is a key part of Covert Action without which the game simply wouldn’t work, and this makes what it does at the end rather cathartically rewarding: once a given plot is finished – either through all conspirators being arrested/going into hiding or the conspirators successfully achieving their goals – Covert Action whisks back the curtain and shows you a complete, step-by-step replay of the plot from start to finish. Often this shows you that while you were farting around in South America the terrorists were mailing bombmaking materials around Asia without you ever suspecting a thing. It’s Covert Action’s equivalent of the literary detective calling everyone together in one room so that they can deliver dramatic revelations about the crime, and it is truly marvellous. 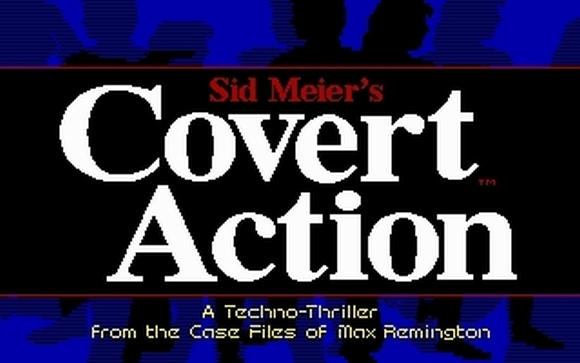 Covert Action pretty much exemplifies what I like so much about the old Microprose games; they didn’t always work out so well, but because they were being made at a time when traditional genres had yet to be established they’ve almost always got at least one very interesting element to them that you just don’t see in games today. I simply can’t imagine a modern mainstream title even attempting what Covert Action does in its metagame2 because it’s so completely at odds with the accepted tenets of game design. Instead it’s left to the indie developers to do so – that is, if they’re not too busy making 16-bit platformer homages and physics-based puzzlers. I doubt we’ll ever see a game like Covert Action again, and that’s a real shame. It may not have been a very good game, but it at least had some very good ideas. Sounds fascinating. How random was the generation of the background plots? If you played the game 100 times, to what extent would you have knowledge that could act as a spoiler, rather than simply having experience that would help in a general sense? The details (like locations) are random but I’m fairly sure the people and plots are pre-set. However, I never saw a repeat despite playing 15-20 cases, and even if you know how the plot works it doesn’t help all that much because you can’t see what is going on *now*. There’s just enough obfuscation to prevent prior experience with the game being an advantage. For example, you might know that one guy is the safe cracker and that he’s going to be receiving the safe cracker kit, but you don’t know who he is, where he is, or where the kit is right now, and the only way to find those things out is by chasing down leads just as you would if you didn’t know. Fascinating. It sounds like it’s ripe for a redo (a la Pirates! ), though I can’t imagine the metagame being half as good in a modern iteration. You could definitely improve on it with modern technology, but Firaxis ain’t ever going to go back to Covert Action (Sid Meier in particular views it as something of a mistake) so it’s probably never going to happen. Even if they did we’d probably end up getting another Railroads.